Kingdom Hearts is one of the most beloved Disney crossovers ever engineered, but the franchise doesn't have much of a presence in actual Disney parks. Kingdom Hearts executive producer Shinji Hashimoto admits he'd love to see that change someday. Hashimoto revealed his big dreams for Kingdom Hearts during Square Enix's annual Shareholders Meeting in Tokyo on June 22 (thanks to KHInsider for the translated information). During a Q&A session, a proclaimed Kingdom Hearts fan wondered aloud if Kingdom Hearts might see a physical crossover with Disney parks similar to how Final Fantasy now has a presence in Universal Studios Japan. "As a Japanese person, it's been nothing short of a dream to be able to play something developed by a Japanese creator with Disney, especially the same Disney that owns such properties like Frozen and Star Wars," Hashimoto replied. "Since Disney has an increasingly high regard for [Kingdom Hearts], I'd like to reach out to them and discuss this further. Sales inside Disneyland will certainly contribute to the growth of the customer base." What form would a Kingdom Hearts / Disney park collaboration ultimately take? Would we see something sensible, like the introduction of sea salt ice cream at Tokyo Disney? 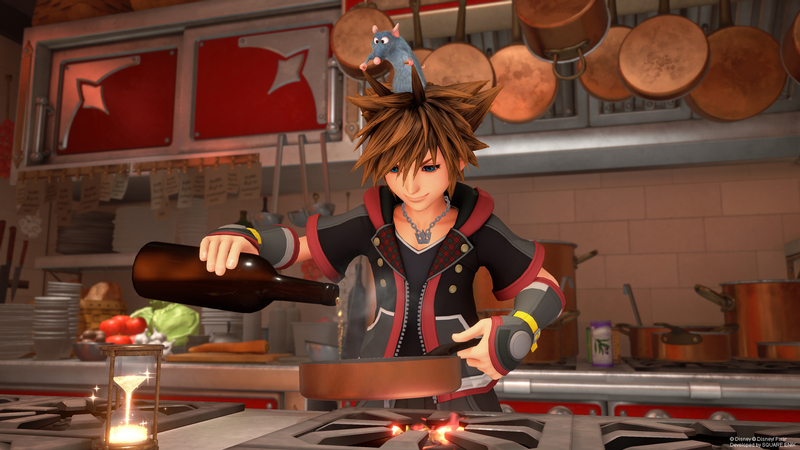 Or would we see something wilder, like a ride that takes you up and down the spikes of Sora's hair until you puke and / or die? If you dream it, it can come true. We're talking about Disney magic, after all. For now, take a look at our Kingdom Hearts 3 guide for everything you need to know about this highly-anticipated RPG. Tagged with News,	Square Enix,	The Walt Disney Company.